ElectricRCAircraftGuy.com--RC, Arduino, Programming, & Electronics: Restoring/Recharging Over-discharged LiPo (Lithium Polymer) Batteries! Before you begin this, you need to know that LiPos are traditionally considered to be somewhat "volatile" and "dangerous." 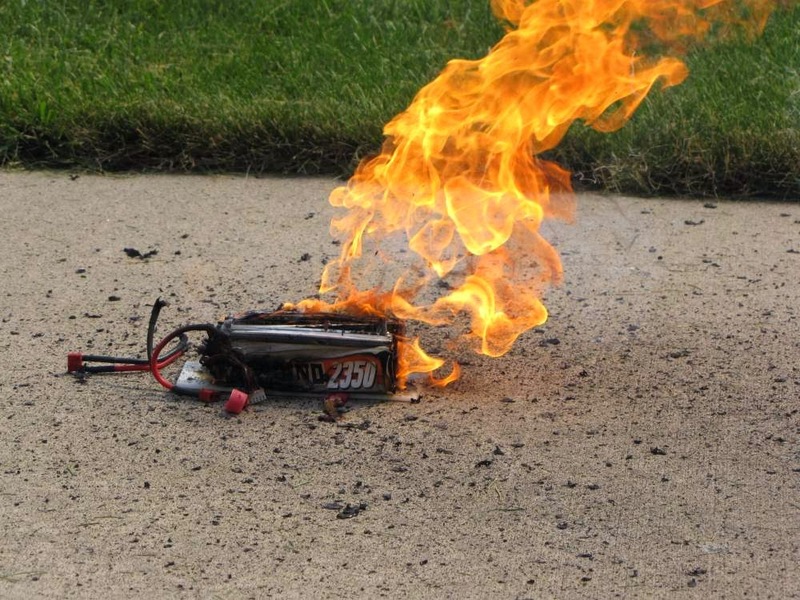 This is because abused LiPo batteries are known to sometimes catch fire, and some have burned down houses or cars, and a fair number of Radio Controlled airplanes have caught on fire during crashes, due to damaged LiPos. During a reasonable or normal discharge, however (even if running in your equipment), LiPos will not spontaneously catch on fire, even if discharged all the way down to 0V/cell. It is the *recharge* phase that would normally cause a fully discharged LiPo to catch on fire, not the discharge phase. The reason is that when a LiPo is brought below ~3.7V/cell, its internal resistance to taking on a charge begins to increase, some of which is permanent. Below ~3.0V/cell the damage becomes significant enough to care about. Below ~2.5V/cell, most manufacturers of LiPo chargers have said that the battery is too dangerous to be recharged. This is because the battery's internal resistance to charging has increased enough at this point that a standard recharge rate would be much too great for a LiPo at this low of a voltage level, since a standard 1C (1 x the battery's capacity) charge current could cause potentially unsafe heat build-up within the battery. Below ~2.0V/cell the LiPo's rate of permanent internal damage has accelerated, below ~1.5V/cell the rate of damage (again, permanent increase in internal resistance) has increased more still, and it only gets worse and worse. The rate at which this damage increases is not linear. It is perhaps a power function of, or exponentially related to the battery's voltage. In either event, it's bad, and special care must be taken. I will now say that I have successfully restored dozens of batteries. Some of the worst ones which I have continued to use were as low as ~1.0V/cell. I have successfully recharged, however, batteries as low as a few mV/cell--perhaps 10mV/cell, or 0.010V/cell. These batteries were useless, however, and rapidly self-discharged back to ~0V/cell after removing them from the charger. Before I go on, let me define what I mean when I say that I have "restored" these LiPos. I do NOT mean I have fixed them, or reversed their damage. I do NOT mean I have brought them back to good-as-new. Rather, I mean I have simply recharged them to a safe, usable level where they can continue to be used. That is all. What I describe below is how I've restored the batteries. Use caution. If your battery is at 0.5V/cell, its internal resistance is far higher than if it has only fallen to 1.0V/cell, and both of these cases have internal resistances far higher still than a LiPo at 1.5V/cell. Again, it seems to me that the relationship is *not* linear. And remember: high internal resistance is what causes heat buildup (and potentially fires if you are not careful), during recharge. So, if you attempt to "restore" your over-discharged LiPos, YOU take full responsibility of what happens next. Having said that, I've never had a problem. The only battery that really concerned me was the one at ~0V/cell, so I really watched it carefully, and I charged it *especially* slowly. It did get hot during recharge, but I charged it at such a low current that the heat did not become excessive (too hot to comfortably touch). I'm not going to go into the details of LiPo balancing chargers, but you'll definitely need a nice charger that can charge and balance multi-cell packs and which has the ability to control the charge current. 1) Thunder AC680 80W balance charger w/accessories - I highly recommend this charger; it works great and has an outstanding value. Comparable chargers to this at many other retailers cost at least 2x more. I have this charger and I love it!--and I should note I have used many chargers, including high-end ones that are several hundred bucks a piece. 2) Turnigy Accucel-6 50W 6A Balancer/Charger w/ accessories - also an outstanding, and dirt-cheap, yet highly functional smart charger. Excellent value; however, it requires an external power supply, such as this: Hobbyking 105W 15V/7A Switching DC Power Supply. 3) General list of chargers from HobbyKing - be sure to READ THE REVIEWS! WARNING: during the initial restoration phase, while the LiPos are <3.0V/cell, do NOT leave them unattended. Constantly monitor them by touching them to ensure they do not get hot, and by sight/touch to ensure they do not puff up (puffing is an indication of released gases due to internal heat build-up). Once >3.0V/cell, you may place them in a fireproof charge container (such as the LiPo-safe fireproof charging bags shown below) and continue the charge process as described in the following steps. If <3.0V/cell, I prefer to constantly feel the battery with my hand to monitor heat build-up, and I always keep a LiPo-safe charge bag nearby in case I need to throw the LiPo in the bag and run outside to let the LiPo burn in a safe area (again, never happened yet, but I don't want something bad to happen the first time there is a problem). A couple of my LiPo-Safe Charging bags. When <3.0V/cell, charge the LiPo at a significantly reduced rate of 1/20~1/10 C rate (1/20~1/10 [0.05~0.10] x its capacity) until it is above 3.0V/cell. 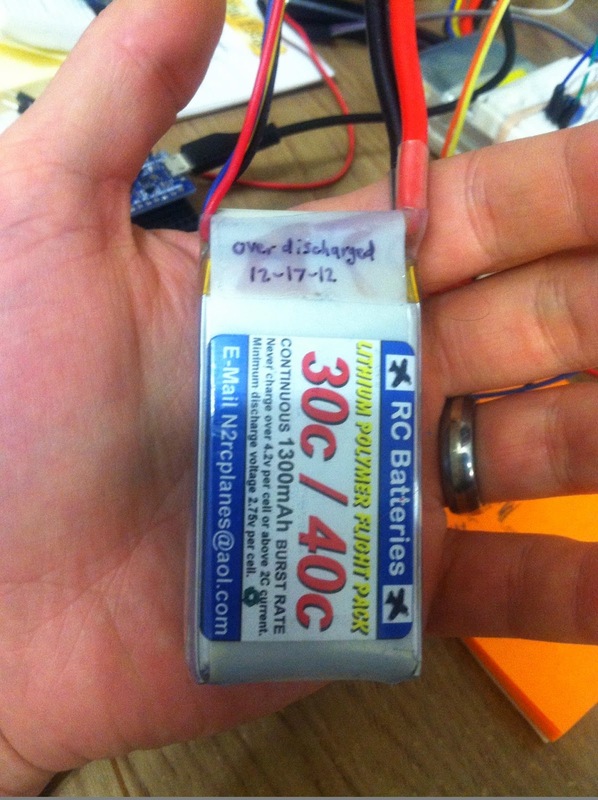 Example: for the LiPo battery shown at the top of this instructable, a 1/20 C charge rate would be 1/20 x 1.3Ah = 0.065A. This is because the battery's capacity, as stated on the label, is 1300mAh (read as "mili-amp-hours"), or 1.3Ah (read as "amp-hours"). So, a 1/20 C charge rate is 1/20 of 1.3, or 0.065A. A 1/10 C charge rate is 1/10 x 1.3 = 0.13A. Note that although some smart chargers can charge at currents as low as 0.05A, many cannot charge at a rate lower than 0.1A. If you cannot set your charger to charge at a current as low as you'd like, simply choose its lowest setting possible, and carefully monitor the battery during the charge. My charger could only go down to 0.1A minimum charge rate, so I set my charger to 0.1A at this point to charge this 1300mAh 3S LiPo. This equates to a 0.077C charge rate (0.1/1.3 = 0.077). Additional Charge Setting Notes: recharging a LiPo below 3.0V/cell may require using a NiMh or NiCad charger setting on the LiPo batteries, as most smart chargers have safety features which prevent a user from attempting to charge a LiPo which is below 2.5V/cell, as this can be dangerous if a standard charge rate is used. Since all we are after is setting a low (and safe) constant charge current to get the LiPo back up to a safe charge level, using a NiMH/NiCad setting is fine until we get the battery >3.0V/cell. WHEN USING AN NIMH or NiCad SETTING TO GET THE LIPOS ABOVE 3.0V/CELL, ***NEVER*** LEAVE THEM UNATTENDED. You should not leave them unattended because the NiMh/NiCad end-of-charge detection method is not compatible with Lithium based batteries, and if left on the charger until full, the end-of-charge state will never be detected and the LiPo battery will be overcharged until it (likely) catches fire and destroys itself (see the burning LiPo picture above; you don't want that to happen). Once above 3.0V/cell, you may optionally increase the charge rate to 1/10~1/5 C rate [0.10~0.2 x its capacity] until the LiPo is ~3.7V/cell or higher. At this point, I set the charge rate for my 1300mAh 3S LiPo to 0.2A. This equates to a 0.2/1.3 = 0.154C charge rate. You may stop holding the battery/constantly feeling it at this time, and place the LiPo in a fireproof container or LiPo-safe charge bag at this point, if desired. Once above approximately 3.7V/cell, you may optionally increase the charge rate again to 1/2 C rate [0.50 x its capacity] until the LiPo is full (4.20V/cell). At this point, I decided to set the charge rate for my 1300mAh 3S LiPo to 0.5A. This equates to a 0.5/1.3 = 0.385C charge rate. Now, use the batteries as normal. The lower the battery was discharged, the more permanent damage it will have. If you use the battery (ex: to fly an RC airplane), and it works ok, then you can safely assume that subsequent charges at 1C are again acceptable (to review: for my 1300mAh LiPo, a 1C rate equates to a charge rate of 1.0C x 1.3Ah = 1.3A). Watch the LiPo over the next few cycles, however, and ensure the battery does not puff during discharging or charging. This would be an indication that the internal resistance of the battery is still too high for normal use and standard 1C charge rates. In any event, due to having over-discharged the LiPos, you may notice a permanent decrease in their capacity (mAh) or maximum discharge rate (ie: they will likely have a reduced discharge C-rating, as noted by lower power output & reduced performance), as the battery’s internal resistance will have been increased, and some permanent damage will exist. Additionally, the longevity of the over-discharged LiPo (ie: how many cycles you can get out of it) will have been reduced. 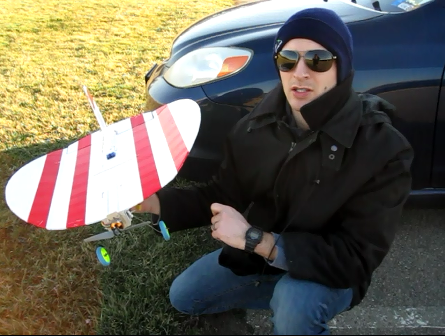 Here is a picture of my airplane which uses my 1300mAh 3S LiPo that I overdischarged. I was able to recover the battery and it is still in use today! I should note, however, that the plane definitely does have reduced power and a lower top speed when using this battery, so the battery definitely has received some permanent damage to its chemistry. Let me know how this works out for you! Be safe! If you found this article interesting, please subscribe to email updates whenever I post new content, via the links at the top-right of this site! Additionally, you may be interested in some of the other articles linked at the top and bottom of this article, especially this one! - Parallel Charging Your LiPo Batteries. Question About Over-discharged LiPo--How do I quantify the amount of damage done to the battery pack? 5) Getting into Scratch Building - 20+ Planes with ONE Motor & ONE Power Pod! 2 Nov. 2014: links for Lawishard for a small 1S LiPo. if the metal tabs have solder already on them, you can just solder to them with no problem. if you don't feel comfortable trying to solder to bare 1S Lipo tabs directly, look for a packaged 1S LiPo with battery lead and everything already attached, and see if you can clip the wire and solder to the clipped wires instead. 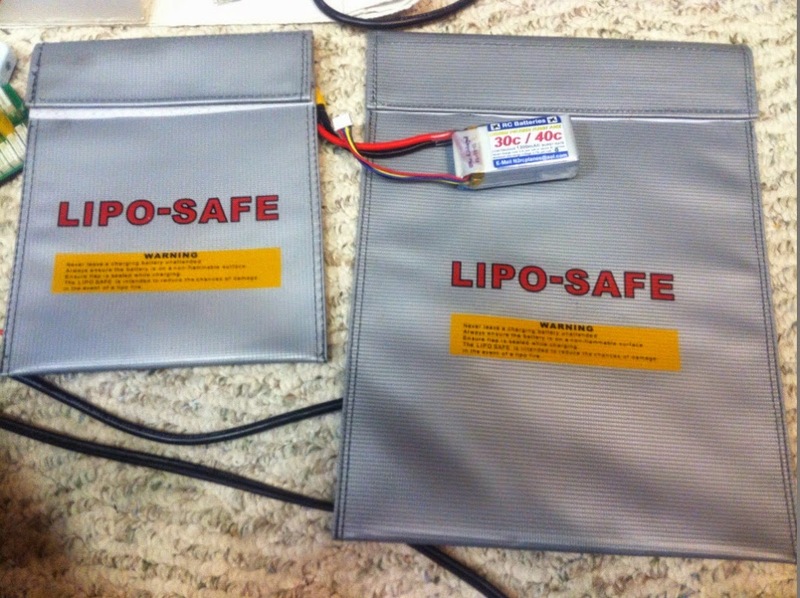 Thank you for your Instructable on restoring LiPo batteries. I have a very tiny LiPo battery from a sleep monitoring device which doesn't seem to take charge. The battery is soldered onto a tiny circuit board. All I know it's a 3.7V battery. It measures 2mm by 20mm by 20mm. Unfortunately, one is not available for sale and a replacement would also be hard to find. So I'm wondering whether it can be restored. Because it's supposed to be charged for 3 hours and the writing on the charger says 5V-0.5A, I worked out that the capacity of the battery is 0.5A X 3 = 1.5Ah. However, I cannot imagine such a small battery having such a large capacity. I estimate that the capacity of this battery is 50mAh. So I'm not sure what the 0.5A indication on the charger means. I think my only chance of restoring the battery is by purchasing this mini LiPo charger, which is capable of producing current as low as 10mA. Also, because my soldering skills are at an absolute zero, I think that rather than desoldering and resoldering the battery wires onto the tiny circuit board, I should cut the battery wires at about midpoint, and then once the restoration is done, solder the wires back together. Is this the correct approach to follow? Finally, if I'm successful in restoring the battery, is there ANY chance whatsoever that the battery may catch fire or explode while it is not charging? I ask this because the device is meant to be pressed against one's forehead during sleep, and obviously a fire or explosion would have the most disastrous consequences. Just an update on my previous post. I measure the voltage across the two points where the battery is welded to the circuit board, and the reading was exactly ZERO. Lawishard, great question; I'll cover each of your points. If I miss anything please reply. First and foremost: if the voltage is exactly 0V, the battery can be recharged, yes, but it will get hot, and it won't hold a charge. It will self-deplete in minutes to hours. ***So, the battery is worthless and must be replaced. *** I'll post some links and more info at the bottom of my article momentarily, for battery replacement options. I think you are correct in estimating the battery's capacity at more like 50mAh, NOT 1500mAh. The 5V 0.5A writing on the charger doesn't make sense to me either in this case unless it is indicating that the power IN to the charger must be 5V and capable of supplying up to 0.5A. That would make more sense. For general use and restoring small lipos in the future, that mini Lipo charger you link to looks great. I think you wouldn't go wrong in buying it. As for your soldering skills, I think it's time to change that. :) At the very top of this article you'll see a link to "Recommended Soldering Kit & Tutorials (for Arduino, Electronics, & Radio Control)". At the bottom of that article you'll find tutorials that are very useful. I think you need to invest ~$50 or so (see the article and look at stuff you'd like---it *can* be cheaper too) and get a small starter soldering kit based on my recommendations, or choosing something similar yourself, and begin to learn to solder. Having said that, cutting the wires at the midpoint to replace a battery is certainly the best route to take in cases where the circuit board is tiny or your skills not quite up to the task to solder to a tiny board directly. Just make sure to put heat shrink tubing or electrical tape very carefully over the bare wires after resoldering or else you can cause a short, which can cause a lipo to rapidly discharge, heating up in the process, and *possibly* causing a fire or mild "explosion." So...don't allow a short on a lipo. Last question: again, this battery is NOT restorable. It needs to be replaced. However, if the battery was down to perhaps 0.5V or 1.0V, I'd say trying to restore it would be worthwhile. Is there ANY chance the battery might catch fire or explode while charging? Yes, of course there's *some* chance, but it's prob. not that high. Personally, if it was me, I'd do a good repair job and I would trust a restored lipo on my forehead if I took the following couple precautions: If you regularly use a low-current charger (such as the one you link to above) you can minimize this risk during regular charging since less heat build-up occurs the slower you charge. Also, don't allow shorts (ex: by doing a poor soldering job, not covering exposed wires well with heat shrink tubing, etc), and use a reputable charger. Oftentimes devices come with lousy chargers because they want to keep a device like yours down to $165 for instance with an ok charger rather than let it cost $200 for your device with a nicer charger. So....if you had restored a lipo and wanted to put it on your forehead, but were worried about it, I would recommend running several test charge/discahrge cycles while feeling the battery for heat buildup. If heat buildup is minimal, trust it. LiPos don't ever spontaneously combust in my experience, rather, *something* must cause it (ie: a short/a rapid discharge, a rapid charge, or an extremely hot environment). So, if I restored a lipo and had a good charger to regularly charge it, and if I tested it for heat buildup over a couple charge/discharge cycles, and it didn't get hot, and if I know I did a good solder job and protected wires properly, yes I'd personally trust it on my forehead. Final note: when a lipo “explodes,” its more like a plastic bag being stomped on while it's on fire---not so much like a bomb going off. That should make you feel at least a touch better. :)....or not. Look for videos on youtube. I just posted some additional links and info at the bottom of my article above, in regards to your needs specifically. Discharged down to 0.0 V on one of the three cells of a lipo. Connected only that cell on NIMH at 0.1 A charge rate; but goes up to 0.2 V and then down to 0 as soon as I remove it from the charger. No heat build-up- does not work either. yes that sounds about right. A cell that low is generally worthless. You can always desolder it, however, and make your 3-cell lipo into a 2-cell lipo! Thanks for the awesome article. Since I am a newbie to LiPo batteries, I just wanted to ask a few questions. I have a 4s 5600mah Lipo that has only one low cell currently at 2.23. Would this method help me to restore the battery to a usable status? My Duratrax LI-24 charger won't charge the battery with the one low cell. When charging (I have the Thunder AC680 on the way in the mail) do I have to put the charger into NiMh or NiCd mode because the cell is below 2.5? Would I use the balance cable like I normally would even if in these other modes to charge? (of course at the low rate of .1 - .2a). I just want to be clear... Thanks so much! Yes, you can definitely restore this lipo. This is a pretty good scenario, with only 1 low cell, and with it above 2 V.
The AC680 prob. wont' charge the LiPo in LiPo mode either, so yes you'll have to use NiCad or NiMh mode. If you can leave the balance lead plugged in that's fine, as it won't do anything in these modes, but the charger will most likely give you an error and not charge if you leave the balance plug in---since a plugged in balance lead tells the charger you are trying to charge a LiPo, but in the wrong mode (since you selected NiMh/NiCad), so you will likely have to leave the balance plug unplugged to trick it into thinking you really are charging a NiMh/NiCad battery. Once you get the cell > 3.0V, however, plug in the balance lead and switch to the LiPo setting to continue the charge. This ensures a good end-of-charge state detection. Side note: The only danger with using the NiMh/NiCad setting to charge a LiPo occurs when a cell nears 4.20V, as the NiMh/NiCad setting will just keep charging right on through that voltage, destroying and possibly catching your LiPo on fire, rather than recognizing it is full and stopping the charge. Fantastic! This is great news... One last question if I may. Does the charger have a setting so that I can charge that one individual cell? Or maybe a better question is- Will the charger be able to charge the one low cell to a safe level without overcharging the other cells all of which are at approx. 3.2 - 3.3 currently? Thanks a lot! I really appreciate your help! Actually Gabriel I figured it all out.... I have successfully restored my battery! Thanks a million for the advice! Thanks it's working. Really grateful bro. What you think about "depuffing" a LiPo? I've never tried depuffing a lipo before, and then re-using it, but it's worth a shot I suppose! Watch out though, I'm betting oxygen reacting with the internal chemicals will ruin the battery. my Accucell 6 will not charge my 3s battery on NiMH at 0.1 A where cells 1 and 2 are at 3.99/3.97 and cell 3 is just over 2.10. I get the following:"Connect Error, Check Main Port". I tried on my old iMax b6 and I get a "Connection Break" error. The cable is plugged directly into the banana plugs and I have the polarity correct. I double checked the banana plugs with the multimeter and am getting 11.86V. I measured with my multimeter on the balance plugs individually and came up with this. Cell 1 reads 3.98V, 2 is 7.98V and 3 is 11.86V (3.98V, 3.99V and 3.89V, respectively). I am throughly confused because both of my chargers and my balance lead battery alarm have the 3rd cell at like 2.10V. I have pulled the suspect pin out of the balance lead connector and cleaned it off as best I could but I am still at a loss. I'm betting one of your connections to the battery (either on one of the balance leads *or* main leads) is broken or separated at the point it connects to the battery. Carefully cut and peel back the battery wrapping with*out* cutting or puncturing any of the LiPo's foil pouches, and with*out shorting any two wires, and you can visually inspect the battery. If a balance lead is pulled out or separated, you can repair it with solder, so long as there is still some solder remaining on the aluminum foil tabs, that you can solder to. If one of the aluminum tabs is broken off, or has no solder remaining on it, repairing it requires special aluminum solder and flux, as regular solder will not stick. Watch out though, aluminum solder and flux is corrosive and will ruin your solder tip. To measure the balance leads, you measure adjacent leads, as the cells are in series, not parallel. Refer to "Figure 1. Schematic of 3S LiPo Battery Pack (3 LiPo Cells in Series)," on pg 26 of the document here. That means cell 1's (+) pin is cell 2's (-) pin, and cell 2's (+) pin is cell 3's (-) and so forth. Measure cell 1 from pin 1 (negative-most pin) to 2, cell 2 from 2 to 3, and cell 3 from 3 to 4 (positive-most pin). Now, what are your voltages when you measure this way? Thanks Gabriel, one of my cell over discharged to 2.14volts yesterday. It was a 3 cell, 3.51,2.13,3.43v's. And it was the battery was brand new. I charged before use to 4.2v per cell. It is a turnigy nano, 25c/50c burst. I was shocked when I check with lipo reader, and have no idea what went wrong with one cell over discharged so differently. So when I tried to charge it with turnigy accucell6. It wouldn't let me. So thanks to Google and your article. I charged my battery with nimh mode @ 0.5a that wad the lowest it could go and of course, with attached lipo reader while charging. Monitoring sitting next to my battery. Now it is saved. Charging it into storage mod now 3.80 each cell totalling 11.40. Jit, glad to help! Hopefully that low cell holds up, as it might have been slightly bad or damaged, or just lower capacity than the other 2 adjacent cells, straight from the factory. I left a 3S lipo connected to a LCD monitor and FPV receiver over night. I assumed, incorrectly, that while those components were powered off there wouldn't be any draw on the battery. The next morning, the total voltage was down to 7.4v, each cell in the 2.3-2.4 range. I found this article, followed the instructions, and restored the battery. I bought 3 of these stuff and used for a month in May 2015- may be 2 or 3 recharges at the most. In June 2015 I charged them to 12V and left them in the cupboard. Today I took them out after 10 months, all of them don't charge - 2 of them show 5V when connected with multimeter. Another one is showing 0. Is there any hope of recovering the batteries? Were they plugged into anything while in the cupboard? How are you measuring the voltage? What is the individual cell voltage for all 3 cells on each battery? No, you can't use that charger to recover the cells. You'll need a smart charger with variable charge current. Dave, sounds like these packs may just be worn out, but you can for sure try recharging on the balance charger. Since they are that close I'd just charge and balance the whole pack at once. The difference between 2.9V and 3.4V is only like 5% state of charge (see my Battery Resting Voltage vs State of Charge Plot at the bottom of my article here, and read more about LiPos and stuff in my ebook here). If your cells were 15%~20% or more apart, however, you'd probably want to charge and monitor the lower cells separately to speed up the balance process, then once they caught up to the other cells, charge the whole pack at once. Even in that case (15~20% apart or more), however, a good balance charger would still do the job just fine charging and balancing the whole pack at once--it just might take forever. This is because the way balance chargers normally work is they add charge to the whole pack at once while burning off excess voltage in individual cells as heat via current coming out of the balance leads. If some cells are full while others are not, the charge to the whole pack is now limited by the microprocessor in the smart charger to the rate at which the already-full cells can be discharged through the balance leads. In short, charging and balancing a very out-of-balance pack takes a long time, but like I said, your pack is barely out of balance at all. Again, refer to the plot & ebook I mentioned. Hi Gabrel, Thanks of the article so far it seems to be helping me out. The question I have is I am restoring a Racers Edge 3s 4100mAH Lipo and have a max B6ACv2 smart charger so I had to use the NIMH setting on the charger at .1a to get the battery back to the voltages close to what you are discussing as the battery was drawn down to .4 volt. The problem now is that two of the three cells have a 2.78 and 2.83 volt charge but the third cell is at 0.00 per the meter on the charger. For some reason that one cell did not take any charge what so ever and not if I try to charge in LIPO mode it states I have the wrong cell count and wants meet charge at 2S what can I do to fix this or equalize the cells? Use an actual Volt meter/multi-meter to measure each cell individually and let me know what you read. See Figure 1 on pg 26 of my big RC document here to see how the balance plug is wired so you know how to measure the cells. First I need us to know for sure what the readings are. I don't want to trust the charger reading yet. Also, wiggle the balance leads as you do so---it may have a broken wire and be unconnected or intermittently connected on one cell. Hello Gabriel. Thank you for your great article! I am stuck into the following situation: I bought a 3s 5000 mah pack and after a couple of flights (450 quad) a cell dropped down to roughly 2V, while the remaining two stayed at 3.17V. I happen to have an Accucell 6 80W sleeping into a customs container (Argentinean Customs are a disgrace...) and have no near expectations to get it into my hands. Meanwhile, I only count on a simple HobbyKing DC-4S which works great on my other packs, but refuses to work with this particular one, because of the low cell voltage I guess. After reading carefully your post, I came into the following idea, and this is why I am writing to you: as I have no way to push some amps into the battery with my equipment, will it be possible to attach an old MP3 charger, which delivers 5V @ 0.3a, into that only cell (via balance port) until it reaches 2.5V? Will you consider it safe? After that, I'd connect the pack to the DC-4S to finish the job, as it will do it at 1,5a max. Of course, the idea is to constantly monitor temperature and voltage to avoid overcharging (and burn things out =X). Well, that is. Hope I made myself clear. Hello again. I finally took courage and tried. Instead of feeding 5.4V directly from adapter, I setted up a voltage divisor to bring down the output to 4.17V. The proccess took place flawlessly and was really slow. After 6 hours the cell reached 2.8V. I then attached a small circuit based on a TP4057 IC at 0.4 ah, which finally brought the cell above 3V. The proccess was finalized by the DC-4S and the pack is now storaged showing 3.8V/cell. I will continue to monitor it. Thanks again for your tips! Juan (Funkytorino), I'm glad you got it worked out on your own! I didn't have time to answer when you asked, but I was concerned about you plugging in a 5V source directly into a LiPo. Thanks for sharing what you did to fix your problem, and I wish you the best in the future! I have a Lipo 4S 6600mah Turnigy Graphene that depletes in 2-3min and it should take about 10-15min to do that. Its internal IR is 5 8 2 1. I left the LIPO charged for about 2 or 3 weeks and after a first flight, voltage dropped from 16 to 14-13.8 in 2-3mins I only had time to land... Very close call. I was told to discharge the battery to 3.5V (all cells)- and then charge it (at a very low C - 0,2-0,3C) to full. THen use it until it reaches 14V and recharge it ... doing some cicles like that. I would like to know your opinion on this and how should I proceed to recover the battery? I forgot to tell you that besides this on I have 3 more LIPOS (all the same- 4S 6600mah Graphene), at least one more has this problem. I put them all in STORAGE mode and will proceed after getting some input from you. I don't know. How much mAh are you actually getting out of the cells? What is the load on the battery during discharge? What makes you think you should get 10-15 min on a flight with this battery? What are your internal resistance units? How did you measure the internal resistance? What is typical for a good one of these batteries? Have you experienced "break-in" (repeated, initial use) improvements with other LiPos? I have a hexacopter that can drain its batteries in 3 min, but that doesn't mean the batteries are bad, it just means it carries a 5 lb payload that shoots fire so it takes a lot of power to get it to fly and do flips. The Drone is a QUAD with a 570Kv Turnigy Multistart rated at 15amp each and it has Hobbywing 40Amp ESCs (overkill I know). It has a Wookong-M and that's it. NO Gimbal, no Camera, nothing else - It should weight 1-1,5kg tops. According to e-calc I should have a hover flight time of 15min, I have done with another of the LIPOs (4S and 6.6Amp Graphene) 13min (and still had some to go. I generally push the lipos so I can land at 14V) so that is how I know this one should do the same. THe IR of the LIPO is 5 8 2 1 (value per cell) - total: 16 (Ohm?). What do you mean by break-in? I now have all the lipos on Storage. How do you think I should proceed? "break-in" means to repeatedly use something, gradually pushing it harder and harder each time. Ex: discharge the LiPo to 3.5V or so at a 2C rate, then at a 4C rate, then an 8C rate, then a 12C rate, then a 20C rate, etc. Sometimes things respond better when you "break them in" like this (ex: gasoline motorcycle engines require a "break-in" routine according to the owner's manual), but I don't expect LiPos to benefit as much. If you were saying the batteries were lasting 10 min instead of 14 I'd say try breaking them in and maybe it'll fix it, but if they're lasting 2 min instead of 14 I'd say you have bad batteries and you need to contact the seller and return them. You can try breaking them in and cycling them though just to be sure but it might not do anything. Please try it out and report back. Also, the IR of cells should be relatively the same among all cells. Compare your IR readings you mentioned above to IR readings of a good battery and report back. I think you have bad batteries and need them replaced. Cycle them on a charger and report back their charge and discharge capacities too to see how the capacities compare to what they should be. Good luck! Post your results back here please, as I'm curious to see how it turns out. Thanks for the comment! It looks like they can be purchased for < $1 a piece too when you buy a pack of them on Amazon! See here: Amazon search for "TP4056"
I have a smaller board TP4056 charger which can regenerate cells. I use it on the balance plug and regenerate cells one by one. If the cell voltage is below 2.85 volt the charger will charge with about 80mA max, but now I am facing a big challenge. My drone lost and I found it 46day later battery was plugged in for 46days and it was at zero voltage for more thena month :( the battery is brand new I only used it once before Infinity Graphene 70C 1500mAh and did not get any hit or deformation in the crash and not puffy so no signs of externel damage. I put fist cell to that regenarator ahd waited now 4 hours, no heating at all, but voltage is still at 0.6V :( no way to get them back? That looks like a pretty good link you shared. I don't think I've ever recovered and been able to use a cell that was less than 1.0V or so (maybe 0.5~1.0V? ), so I think you're out of luck: buy a new battery. There is too much permanent damage done. I think it has to do with crystal growth from anode to cathode which punctures internal cell walls and internally shorts the battery or something--I'd have to do a lot more research to be able to speak more knowledgeably than that, and to verify my facts. In either case, sorry, but you'll have to buy a new battery. Thanks Gabriel for the info. Th bad news 3 of the 4 cells are short and I was not able to regenerate, but 1 cell from the middle of the battery was recovered and charged fully. Luckily I had a same tipy of 4S battery where only ne cell damaged in crash. I made a 4s using the recovered cell and teh 3 remaining from that battery and it flies perfect, no voltage drop. At leaset I could recover 1 cell and fix my other batery using that. Hi, taking a guess that the tiny LiPo cells from picture frames are probably trash now. Some of them are over 6 years old and though charged at the factory are most likely bricked, attempted to restore them but they are usually hopeless. I did get one working from an E-cig though and the slightly older "metal" case ones seem more robust.